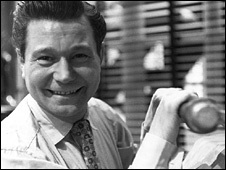 Comedy actor Reg Varney, best known for playing driver Stan Butler in ITV sitcom On The Buses, has died aged 92. He died following a short illness in a nursing home in Budleigh Salterton, Devon, where he had recently been admitted with a chest infection. His daughter Jeanne Marley, 59, said her father had died "peacefully" on Sunday afternoon. 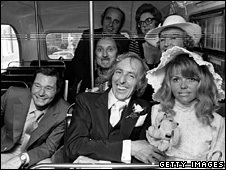 On The Buses was one of the most successful British comedies of the 1970s, with over 60 TV episodes. Varney's partnership with co-star Bob Grant, who played randy conductor Jack Harper, saw them become household names for a generation of viewers. The series, which ran for seven years from 1969 and spawned three feature films, followed the two characters as they dodged work and did their best to wind up inspector Cyril "Blakey" Blake, played by Stephen Lewis. Mrs Marley said he had only recently been admitted to the nursing home after he had begun suffering from a chest infection. She said: "He's always been very young for his age. When he was in On The Buses he was playing a 35-year-old, but he was actually 50." Varney was born in east London as one of five children, and attended school in West Ham. He worked at the Regent's Park Hotel after leaving school, but went on to play the piano and sing in working men's clubs. Varney entertained the forces during World War II, where he served in the Royal Electrical Engineers, and later appeared in seaside shows and played pantomime dames. He first came to the public eye in BBC sitcom The Rag Trade, in 1961, and starred alongside Pat Coombs and June Whitfield in another comedy, Beggar My Neighbour, in 1966. In 1967, Varney opened the UK's first automatic cash dispenser in Enfield, north London. I always find it upsetting when a comedian dies as they bring so much happiness to everyone. The success of On The Buses saw him land his own, self-titled TV series, as well as roles in films Go For A Take and The Best Pair Of Legs In The Business. Later in his career Varney spent time in Australia and New Zealand, sometimes working as a pianist. A remake of On The Buses was mooted in 1990, but failed to be commissioned. Varney had lived in Devon for the past 20 years, and had lived alone since his wife Lilian died in 2002. He is survived by his daughter, two grandchildren, and one great-grandchild.